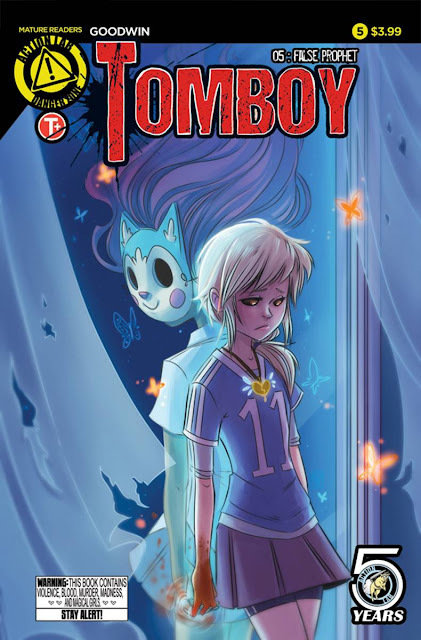 The second arc of Action Lab's best series 'Tomboy' by Mia Goodwin begins as a nice jumping on point for new readers (but you really should pick up the first trade).Goodwin puts us back in the middle of the drama with the corrupt Detective Tico babysitting. It's the dichotomy of the character who on one hand is the caring "uncle" to his dead partner's child and friend to his wife while also tracking down the "Wolf of Rivergrove" aka Addison. Except he doesn't know it's Addison he's after. So Jessie is kidnapped instead and if there's one thing the Trents can't afford is to be exposed. Addison knows Jessie's in danger but her grandfather discourages her from helping rescue and jeopardize exposing herself and her family. But then what good are these powers if you can't help someone in need, she thinks. Goodwin is merely maneuvering the players in position for what is sure to be a bloody confrontation. The great thing about Goodwin's storytelling is that it doesn't feel rushed or convoluted. It's playing out efficiently but at its own pace, allowing for actions taking place to settle in and breathe. The characterizations are pretty complex with motivations that make sense. The stubborn anti-hero willing to risk it all to help her friend, the friend who's in-over-head and unaware of just how much danger she's in, the dirty cop forced to do someone else's bidding or lose everything himself all culminates in one big exciting story you can't help get drawn into. With Goodwin also doing the art there is a lot of continuity and synergy with the story. Goodwin is equally good at storytelling with images as she is with words. She knows what to reveal and when to let her art do the talking. Michelle wong handles colorist duties and she continues to give the proper pastel look in soft blues and purples that Goodwin had been doing.